August of 1990 was my Senior year in college. I moved into an apartment in a very notorious neighborhood of my college town. I was helping my roommate (one of four guys living in this place) put together this huge entertainment center. He sent me out to get a case of beer for the job. We lived next door to a liquor store. I was back with the case (likely Keystone) in hand. He didn't even know I had left. We got so drunk that we named the entertainment center "The Ferderko" (after Bernie Ferderko). That was how the 90s began for me. They ended with me three degrees later, married, living 300 miles away from that liquor store and the Ferderko, with a new baby son. So yeah, I saw some changes. 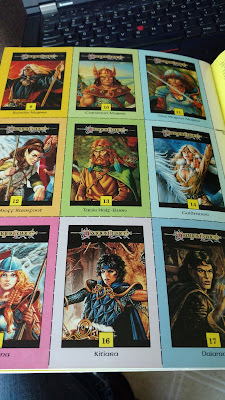 Dragon, D&D and especially TSR saw a lot of changes in the 90s too. But that was not obvious to us in August of 1990 when issue #160 came out. So let's turn on some Star Trek TNG Season 4, fire up the 386SX and let's get going on Issue #160 of This Old Dragon. The cover looks like it should be part of a Halloween issue, but it is actually for the special topic section of Urban adventures. I was quite excited to see this, to be honest. During the last couple of years of my High School AD&D game we focused largely on urban adventures. My then DM and I even wrote up our own "Urban Survival Guide". Kinda wish I still had that, would be cool to polish it up and use it. At this point I should note that this particular Dragon, while not my original from then, is in surprisingly great shape. The covers are still on it and it doesn't reek of mildew. Inside we get an ad that would shape my entire 2nd Ed AD&D experience. The first ad for the Ravenloft campaign world. I bought everything for Ravenloft back then, when I could afford it, from the newly opened Castle Perilous Games in Carbondale, IL. Ravenloft was my world. First up is The Enemy at the Gates by James R. Collier. This details some of the magical defenses a city must have to survive in the *D&D game worlds. It's a good read, to be honest, and anyone with solid knowledge of the D&D spells or monster could likely come up with even more ways to attack a city. Examples of +1 swords to Ents/Treants are given. I also once destroyed a keep full of vampires with a charmed blue dragon in a game. Likely right around this same time to be honest. The article is good in describing all sorts of attacks, but not much in the way of defending against those attacks save for "fight dragons with dragons!". The material though is still good after all these years and it can be used with just about any FRPG. The article is also quite a long one. The Last Call Inn by Willie Walsh is a sample inn and tavern with maps that can be used in any AD&D game. Again, while it says AD&D on the tin, it could be used with any FRPG. The article is more than just a map and room descriptions. It covers running the inn, prices, costs and setting up shop. The economy is very AD&D 1st ed, though I think it was trying for AD&D 2nd ed. 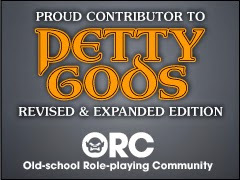 Stats for NPCs are 2nd Ed. Matthew J. Iden is next with a thieves' guild in The Touch of the Black Hand. 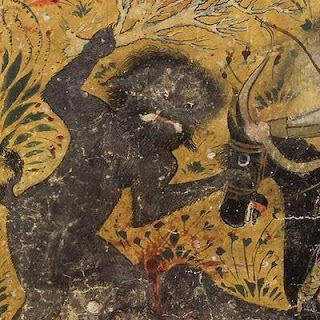 By this time we have seen a lot of Dragon articles on thieves' guilds and assassin guilds. This one is good but doesn't expand much on the articles from the earliest days of the Dragon. Maybe I should collect them all and have a look at them in that perspective. I bet then I could find something unique and useful in each one. 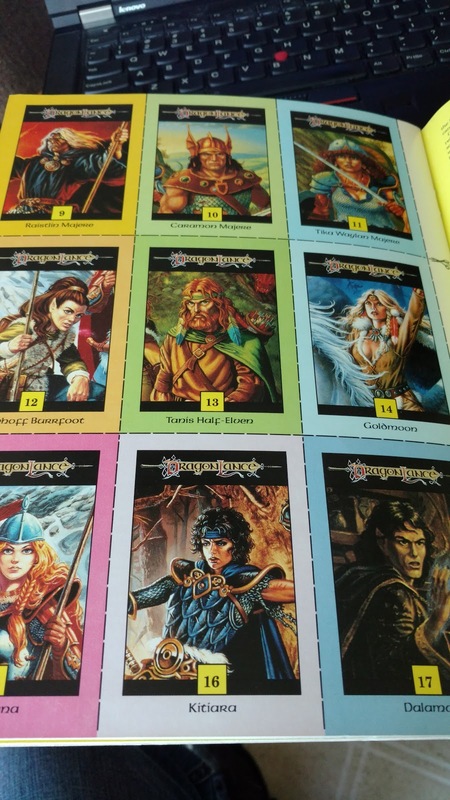 Sage Advice covers some questions on Krynn and Greyhawk. A big, garish, advertisement for Chill 2nd Edition. The 90s were going to be about horror. I didn't know that then, but the writing is there on the walls as if it had been written there in blood by Anne Rice or Poppy Z. Brite. I started the 90s with Ravenloft, ended it with WitchCraft. Had Chill and Vampire in-between. +Bruce Heard is up with Up, Away, And Beyond: Space Travel in D&D a topic he is well versed in. I'll even go as far to say as one of the two or three experts in it. There are a couple of things in this article right away. This is for D&D. Not AD&D. So we are talking BECMI here. There is even a bit on how the D&D and AD&D worlds are not linked. So you can't use space travel to get to one from the other. Well, I tend to disagree, but that is the beauty of these games right. There is a lot here really. Heard talks about different shaped worlds, odd gravity and how to work Spelljammer into all of this. Fascinating read really. A lot of this can also all still be used today, whether or not you use Spelljamer or Bruce's own Calidar setting. Naturally, this is followed up by an episode of Voyage of the Princess Ark. The Role of Computers is up next. I could not help but notice it was Copyright 1990 by the authors. Not too uncommon really, but will cause some problems for WotC when they try to re-publish these in ten years. Nigel D. Findley is up with The Ecology of the Gibbering Mouther. Did you know that creatures killed and eaten by the Mouther can not be raised, resurrected or reincarnated? I don't think I did. Yes, this thing actually eats your soul too. 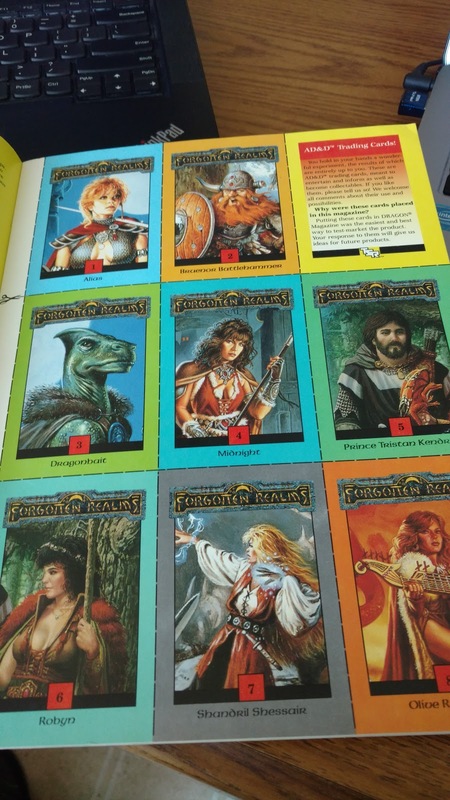 In the middle of the magazine, and still intact are some of the then new AD&D Trading Cards. I really don't know much about these, to be honest. I was never a collectible card guy. Are they worth anything? Inside is also a poster for Dungeon magazine. The fiction piece, Thief On A String, features a scene that Mission: Impossible will steal in 6 years. 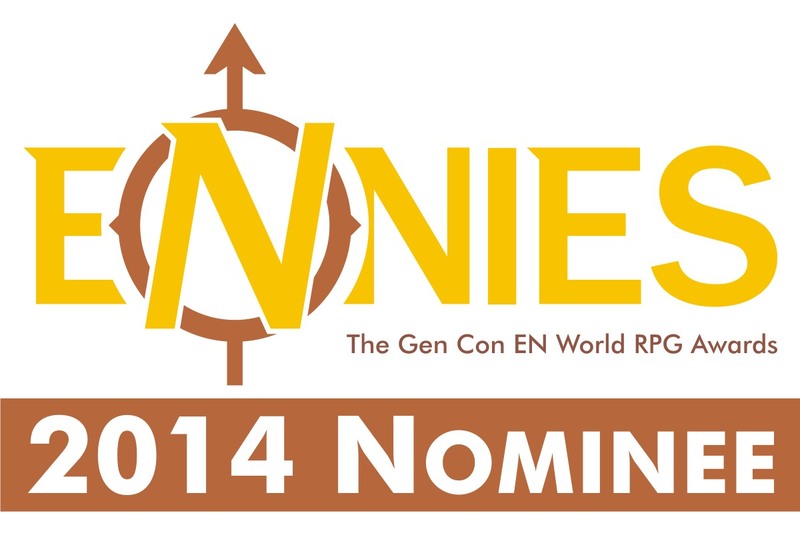 More ads...The Convention Calendar reminds us to get our tickets for Gen Con early. They had 10,000 people now two years running! Another article that could see new life today is one from Mark E. Smith on There Are No Generic Black Belts: Defend yourself with a variety in TOP SECRETS/S.I.™ games. I am not sure if the rules will match up with the new Top Secret coming out, but the advice is solid. Several styles are covered here. Interestingly enough, the one that I was studying at this time and into grad school, Isshinryu, is listed here. I don't see it mentioned much. Novel Ideas is more of an ad than it is an article. J. Eric Severson covers the Buck Rogers novels from TSR. Also, more of an advertisement than an article is the Game Wizards detailing the new Ravenloft campaign setting. I was very, very excited to see this. We get a lot of ads and the comics. And since I actually have one this time, the back cover features the Hollow World. This is a nostalgic issue for me if only for the time it represents and not really for the content inside. Soon I would stop buying Dragon and eventually even D&D stuff completely. Grad School makes for some difficult times for gaming. I suppose it is good then that I don't have many issues past this one. I have no real insights to them having not read them when they were new and not even playing for much of the late 90s. Still, it is fun to look back on these. 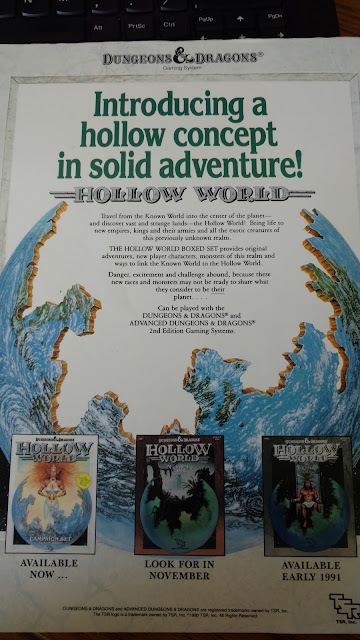 THe Hollow World reprint is nice (miss the poster maps, but still). And folks who like Mystara of course should check out Mr. Heard's Calidar series (3rd book just funded on KS). The cards aren't worth much. Supposedly the 93 series seems to have a little more value but that's apparently due to them shutting down the printing presses because TSR was switching gears into CCGs like Spellfire.